Every time we open up a wall, we’re secretly hoping to find a big wad of cash – or at least some fun little trinkets. Obviously, I’ve watched too many episodes of “If Walls Could Talk” on HGTV. When we started busting open the master bathroom walls this afternoon I was really optimistic. Alas, we came up empty handed yet again. We did find something else in the walls, though. Or many things, I should say, that explain why the bathroom has always had a funky smell despite a few detox cleanings. First, we found a birds nest. 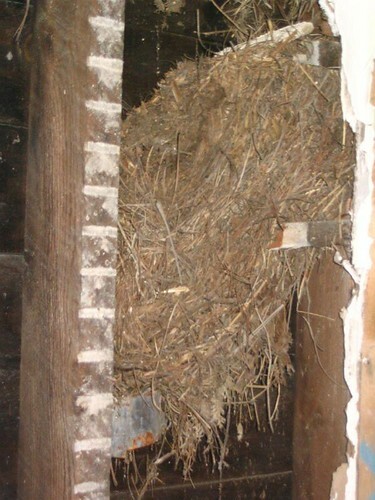 It was packed in there so nice and tight we thought it might be some type of primitive insulation. Right up until we got to the top and saw the poop and feathers…. Next, we unearthed what appears to be a squirrels nest. Some of the fillings, and the (quite different, equally pungent) smell gave it away. But the best find was the last one. Because when we went to unlodge an old and intricate wasps nest from another wall cavity, we saw two small field mice scurry out of it. It appears they built a nice warm bed for themselves on top of the wasp nest. My first comment was “Well, at least they’re the cute kind!”. Teague was not nearly as amused. 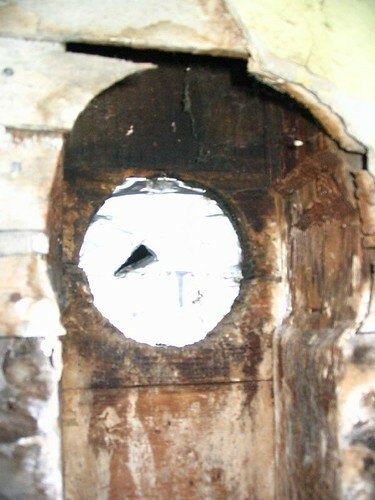 We think they might be entering through an old vent hole in the exterior wall, since it was covered with DUCT TAPE. Yeah…. duct tape. A single layer, with a hole in it. They didn’t even bother finding an old tuna can lid!! I don’t know how we managed to miss seeing this patch job when we were up there re-roofing, but it gave us a good laugh. 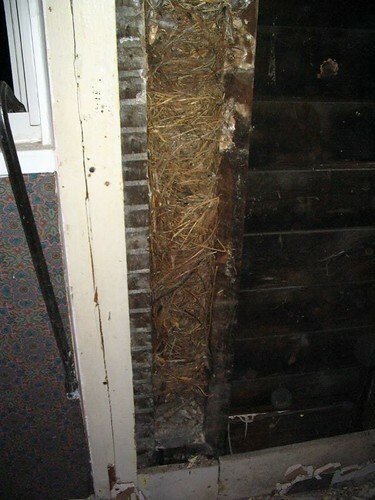 When I tore out the walls in the crafts room upstairs I found two of the wall cavities crammed full of nesting materials and boy did it stink. They were packed with stuff but nothing to make me rich either. I thought rats and mice were supposed to collect bright shiny things like jewelry and gold coins! Yeah- it doesn’t sound quite like the find you wanted. The good part is you will now know that it is clean and insulated when you are done! I wonder what the R-value of a nest is? WOW…quite a little zoo you had going in the walls! I’ll bet you’re glad to get that cleaned out! Can’t wait to see the progress on your master bath! Ewww, I wonder if something similar created the bizarre stink in our master bedroom soon after we first moved in. Grody. I don’t want to think about that.